Please note that the information below applies only to Intel 1000, 3945, 4965, 5100, 5150, 5300, 5350, 6200, 6250, 6300, 6350 adapters. Newer adapters (7xxx and 8xxx series) do not require specific driver versions. To use your Intel adapter for network monitoring in CommView for WiFi and TamoGraph Site Survey, you must make sure that you use a driver version that supports packet capturing. Versions prior to 12.4.3.9 did not support packet capturing. Versions from 12.4.3.9 to 13.5.0.0 work fine. Versions newer than 13.5.0.0 contain a critical bug that makes it impossible to capture Wi-Fi packets on any channel other than 6. 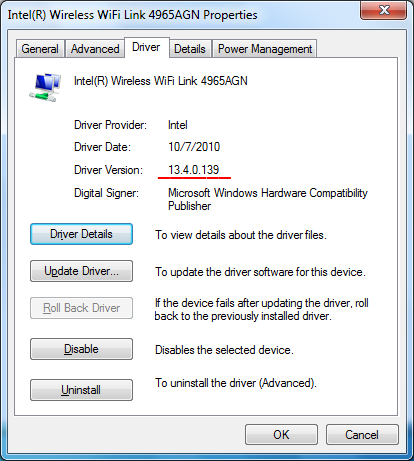 At the time of writing, the latest Intel driver version is 15.1.1 and it is unusable for packet capturing. TamoSoft notified Intel about this bug on November 1, 2011. Intel acknowledged the bug, but refused to fix it. Intel 1000, 3945, 4965, 5100, 5150, 5300, 5350, 6200, 6250, 6300, 6350 adapters are NOT supported on Windows 10.